This tool identifies statistically significant spatial clusters of high values (hot spots) and low values (cold spots) as well as high and low outliers within your dataset. It automatically aggregates incident data, identifies an appropriate scale of analysis, and corrects for both multiple testing and spatial dependence. This tool interrogates your data in order to determine settings that will produce optimal cluster and outlier analysis results. If you want full control over these settings, use the Cluster and Outlier Analysis tool instead. Incident data are points representing events (crime, traffic accidents) or objects (trees, stores) where your focus is on presence or absence rather than a measured attribute associated with each point. The computed settings used to produce optimal cluster and outlier analysis results are reported in the Results window. The associated workflows and algorithms are explained in How Optimized Outlier Analysis works. This tool creates a new Output Feature Class with a Local Moran's I index (LMiIndex), z-score, pseudo p-value and cluster/outlier type (COType) for each feature in the Input Feature Class. It also includes a field (NNeighbors) with the number of neighbors each feature included in its calculations. The COType field identifies statistically significant high and low clusters (HH and LL) as well as high and low outliers (HL and LH), corrected for multiple testing and spatial dependence using the False Discovery Rate (FDR) correction method. The z-scores and p-values are measures of statistical significance that tell you whether or not to reject the null hypothesis, feature by feature. In effect, they indicate whether the apparent similarity (a spatial clustering of either high or low values) or dissimilarity (a spatial outlier) is more pronounced than one would expect in a random distribution. The z-score and p-values in the Output Feature Class do not reflect any kind of FDR (False Discovery Rate) corrections. For more information on z-scores and p-values, see What is a z-score? What is a p-value? A high positive z-score for a feature indicates that the surrounding features have similar values (either high values or low values). The COType field in the Output Feature Class will be HH for a statistically significant cluster of high values and LL for a statistically significant cluster of low values. A low negative z-score (for example, less than -3.96) for a feature indicates a statistically significant spatial data outlier. The COType field in the Output Feature Class will indicate if the feature has a high value and is surrounded by features with low values (HL) or if the feature has a low value and is surrounded by features with high values (LH). The COType field will always indicate statistically significant clusters and outliers based on a False Discovery Rate corrected 95 percent confidence level. Only statistically significant features have values for the COType field. The Input Features can be points or polygons. With polygons, an Analysis Field is required. If you provide an Analysis Field, it should contain a variety of values. The math for this statistic requires some variation in the variable being analyzed; for example, it cannot solve if all input values are 1. With an Analysis Field, this tool is appropriate for all data (points or polygons) including sampled data. In fact, this tool is effective and reliable even in cases where there is oversampling. With lots of features (oversampling), the tool has more information to compute accurate and reliable results. With few features (undersampling), the tool will still do all it can to produce accurate and reliable results, but there will be less information to work with. With point data you will sometimes be interested in analyzing data values associated with each point feature and will consequently provide an Analysis Field. In other cases, you will only be interested in evaluating the spatial pattern (clustering) of the point locations or point incidents. The decision to provide an Analysis Field or not will depend on the question you are asking. Analyzing point features with an Analysis Field allows you to answer questions such as Where do high and low values cluster? Analyzing point features when there is no Analysis Field allows you to identify where point clustering is unusually (statistically significant) intense or sparse. This type of analysis answers questions such as Where are there many points? Where are there very few points? For COUNT_INCIDENTS_WITHIN_FISHNET_POLYGONS and COUNT_INCIDENTS_WITHIN_HEXAGON_POLYGONS, an appropriate polygon cell size is computed and used to create a fishnet or hexagon polygon mesh which is then positioned over the incident points and the points within each polygon cell are counted. If no Bounding Polygons Defining Where Incidents Are Possible feature layer is provided, the cells with zero points are removed and only the remaining cells are analyzed. When a bounding polygon feature layer is provided, all cells that fall within the bounding polygons are retained and analyzed. The point counts for each polygon cell are used as the analysis field. Although fishnet polygons are the more common aggregation shape used, hexagons may be a better option for certain analyses. For COUNT_INCIDENTS_WITHIN_AGGREGATION_POLYGONS and COUNT_INCIDENTS_WITHIN_HEXAGON_POLYGONS, you need to provide the Polygons For Aggregating Incidents Into Counts feature layer. The point incidents falling within each polygon will be counted and these polygons with their associated counts will then be analyzed. The COUNT_INCIDENTS_WITHIN_AGGREGATION_POLYGONS is an appropriate aggregation strategy when points are associated with administrative units such as tracts, counties, or school districts. You might also use this option if you want the study area to remain fixed across multiple analyses to enhance making comparisons. For SNAP_NEARBY_INCIDENTS_TO_CREATE_WEIGHTED_POINTS, a snap distance is computed and used to aggregate nearby incident points. Each aggregated point is given a count reflecting the number of incidents that were snapped together. The aggregated points are then analyzed with the incident counts serving as the analysis field. The SNAP_NEARBY_INCIDENTS_TO_CREATE_WEIGHTED_POINTS option is an appropriate aggregation strategy when you have many coincident, or nearly coincident, points and want to maintain aspects of the spatial pattern of the original point data. In many cases you will want to try SNAP_NEARBY_INCIDENTS_TO_CREATE_WEIGHTED_POINTS COUNT_INCIDENTS_WITHIN_FISHNET_POLYGONS and COUNT_INCIDENTS_WITHIN_HEXAGON_POLYGONS to see which result best reflects the spatial pattern of the original point data. Fishnet and hexagon solutions can artificially separate clusters of point incidents, but the output may be easier for some people to interpret than weighted point output. Analysis of point data without specifying an Analysis Field only makes sense when you have all known point incidents and when you can be confident there is no bias in the point distribution you are analyzing. With sampled data you will almost always be including an Analysis Field (unless you are specifically interested in the spatial pattern of your sampling scheme). When you select COUNT_INCIDENTS_WITHIN_FISHNET_POLYGONS or COUNT_INCIDENTS_WITHIN_HEXAGON_POLYGONS for the Incident Data Aggregation Method, you may optionally provide a Bounding Polygons Defining Where Incidents Are Possible feature layer. When no bounding polygons are provided, the tool cannot know if a location without an incident should be a zero to indicate that an incident is possible at that location, but didn't occur, or if the location should be removed from the analysis because incidents would never occur at that location. 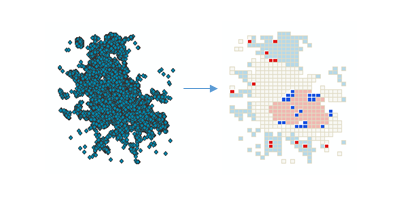 Consequently, when no bounding polygons are provided, only cells with at least one incident are retained for analysis. If this isn't the behavior you want, you can provide a Bounding Polygons Defining Where Incidents Are Possible feature layer to ensure that all locations within the bounding polygons are retained. Fishnet or hexagon cells with no underlying incidents will receive an incident count of zero. Any incidents falling outside the Bounding Polygons Defining Where Incidents Are Possible or the Polygons For Aggregating Incidents Into Counts will be excluded from analysis. The Performance Adjustment parameter specifies how many permutations are used in the analysis. Choosing the number of permutations is a balance between precision and increased processing time. Increasing the number of permutations increases precision by increasing the range of possible values for the pseudo-p.
Permutations are used to determine how likely it would be to find the actual spatial distribution of the values you are analyzing. For each permutation, the neighborhood values around each feature are randomly rearranged and the Local Moran's I value calculated. The result is a reference distribution of values that is then compared to the actual observed Moran's I to determine the probability that the observed value could be found in the random distribution. The default is 199 permutations; however, the random sample distribution is improved with increasing permutations, which improves the precision of the pseudo p-value. The tool will calculate the optimal scale of analysis based on the characteristics of your data or you may set the scale of analysis through the Distance Band parameter in the Override Settings. For features with no neighbors at this distance, the Distance Band is extended so each feature has at least one neighbor. Instead of letting the tool choose optimal defaults for grid cell size and scale of analysis, the Override Settings can be used to set the Cell Size or Distance Band for the analysis. While a number of linear units appear in the Cell Size and Distance Band drop-down list, the tool only supports kilometers, meters, miles and feet. The Cell Size option allows you to set the size of the grid used to aggregate your point data. You may decide to make each cell in the fishnet grid 50 meters by 50 meters, for example. If you are aggregating into hexagons, the Cell Size is the height of each hexagon and the width of the resulting hexagons will be 2 times the height divided by the square root of 3. You should use the Space Time Pattern Mining tools or the Generate Spatial Weights Matrix and Cluster and Outlier Analysis tools if you want to identify space-time hot spots. More information about space-time cluster analysis is provided in the Space Time Pattern Mining documentation or the Space-Time Cluster Analysis topic. The Output Features layer is automatically added to the table of contents with default rendering applied to the COType field. The rendering is defined by a layer file in <ArcGIS>\Desktop10.x\ArcToolbox\Templates\Layers. You can reapply the default rendering, if needed, by importing the template layer symbology. The point or polygon feature class for which the cluster and outlier analysis will be performed. The output feature class to receive the result fields. The numeric field (number of incidents, crime rates, test scores, and so on) to be evaluated. The aggregation method to use to create weighted features for analysis from incident point data. COUNT_INCIDENTS_WITHIN_FISHNET_POLYGONS —A fishnet polygon mesh will overlay the incident point data and the number of incidents within each polygon cell will be counted. If no bounding polygon is provided in the Bounding_Polygons_Defining_Where_Incidents_Are_Possible parameter, only cells with at least one incident will be used in the analysis; otherwise, all cells within the bounding polygons will be analyzed. COUNT_INCIDENTS_WITHIN_HEXAGON_POLYGONS —A hexagon polygon mesh will overlay the incident point data and the number of incidents within each polygon cell will be counted. If no bounding polygon is provided in the Bounding_Polygons_Defining_Where_Incidents_Are_Possible parameter, only cells with at least one incident will be used in the analysis; otherwise, all cells within the bounding polygons will be analyzed. COUNT_INCIDENTS_WITHIN_AGGREGATION_POLYGONS —You provide aggregation polygons to overlay the incident point data in the Polygons_For_Aggregating_Incidents_Into_Counts parameter. The incidents within each polygon are counted. SNAP_NEARBY_INCIDENTS_TO_CREATE_WEIGHTED_POINTS —Nearby incidents will be aggregated together to create a single weighted point. The weight for each point is the number of aggregated incidents at that location. A polygon feature class defining where the incident Input_Features could possibly occur. The polygons to use to aggregate the incident Input_Features in order to get an incident count for each polygon feature. This analysis utilizes permutations to create a reference distribution. Choosing the number of permutations is a balance between precision and increased processing time. Choose your preference for speed versus precision. More robust and precise results take longer to calculate. QUICK_199 —With 199 permutations, the smallest possible pseudo p-value is 0.005 and all other pseudo p-values will be even multiples of this value. BALANCED_499 —With 499 permutations, the smallest possible pseudo p-value is 0.002 and all other pseudo p-values will be even multiples of this value. ROBUST_999 —With 999 permutations, the smallest possible pseudo p-value is 0.001 and all other pseudo p-values will be even multiples of this value. The size of the grid cells used to aggregate the Input_Features. When aggregating into a hexagon grid, this distance is used as the height to construct the hexagon polygons. This tool only supports kilometers, meters, miles and feet. The spatial extent of the analysis neighborhood. This value determines which features are analyzed together in order to assess local clustering. The following Python window script demonstrates how to use the OptimizedOutlierAnalysis tool. The following stand-alone Python script demonstrates how to use the OptimizedOutlierAnalysis tool. The Random Generator Type used is always Mersenne Twister.